Two and a half years ago, I wrote God in the Battle Space. I cited the example of Lt. Col. Jason Bohm as exemplary of the kind of interaction with the population that engenders trust. There is another presence in the battle space – that of lawyers. To be sure, no one intends for there to be any deleterious affects from the presence of law school graduates in the battle space. But equally as sure, their presence has complicated things. MARJAH, Afghanistan—As Capt. Anthony Zinni monitored a live video feed from a Predator drone circling overhead, he spotted four men planting a booby trap in the middle of the road here. For Capt. Zinni, one of the officers responsible for approving airstrikes in the nine-day-old battle for Marjah, it seemed like an easy call: The men were digging a hole alongside a road where a Marine supply convoy was scheduled to pass within hours. But just as he was about to give the order to strike, Capt. Zinni spotted even-smaller white figures on the video running along the path south of the canal. When Capt. Zinni spotted the four men planting the booby trap on the afternoon of Feb. 17, the first thing he did was call his lawyer. Capt. Matthew Andrew, judge advocate for 1st Battalion, 6th Marine Regiment, advises the battalion about when it is legal to order the airstrikes. He examined the figures on the video feed closely. “I think you got it,” Capt. Andrew said, giving the OK for the strike. Capt. Zinni, 35 years old, grew up among Marines—his father is retired Gen. Anthony C. Zinni, former commander of all U.S. forces in the Middle East—and always seemed destined for the Corps. The Marines watch almost constant video feeds from unmanned aircraft, including Predators armed with Hellfire missiles and piloted remotely by crews at an Air Force base near Las Vegas. The suspected insurgents were digging on a road that ran along the north bank of a wide canal, part of an elaborate irrigation system built with U.S. aid money in the 1950s. Knowing that the Marine convoy was due to pass over the spot in a couple of hours added pressure to the decision about whether to strike. Once Capt. Zinni spotted the children and called off the strike, Capt. Andrew loitered behind the Marines at the monitors, pondering the situation. “We have to separate the insurgents from the people,” he said. “If we just bomb the hell out of everything, we’ll have a hard time doing that.” But the Marjah battlefield was constantly changing, with insurgents and civilians often in close proximity. “If we can ensure there aren’t any kids around, you have a good shot,” he told Capt. Zinni. On a cot nearby, Lance Cpl. José Guzman-Berrios, a 19-year-old from Carolina, Puerto Rico, was monitoring chat messages pouring in from the Predator mission commander in Nevada. “Children are out of view 30 meters down the road walking west,” Lance Cpl. Guzman-Berrios read aloud. The children, however, soon walked back into view on the screens, pacing along the path south of the canal. Capt. Andrew suggested that a show-of-force—a loud, low pass by a helicopter or jet—might scare the men into bolting for the compound, or, at least, interrupt their work. “Or they might go into a field, and we may be able to kill them,” Maj. Harris added. Capt. Zinni had seen this scenario before in Marjah. Insurgents using women and children for cover as they moved weapons or crossed open spaces into fighting positions in buildings. In this case, the captain was certain that the children were acting—either by their own volition or under coercion—as shields for the men planting the bomb. The way the Taliban see it, he thought, they’d win either way: The Americans might hold their fire and allow them to plant a bomb unmolested. Or the Americans might kill a few civilians, a propaganda victory for an insurgent force increasingly adept at using the media to spread its message. “We’re not going to be able to hit this,” Capt. Zinni concluded. He ordered the Predator pilot to keep an eye on the men. Maybe they’d lead the Marines back to their commander’s position. Or maybe they’d make a mistake and leave through an area clear of civilians. But the children returned. “Two children on the opposite side of the canal, approximately 15 meters,” came the message from Las Vegas. The pilot aborted the attack run and continued to circle. Capt. Ramthun relayed Capt. Zinni’s decision to the Predator pilot. “Shot is no longer authorized,” he said. That evening, the scheduled Marine supply convoy rambled down the dirt road. Warned of the booby trap, the vehicles stopped short of the spot where the men were seen digging. The Marines removed a buried triggering device, set to detonate the explosives when a vehicle passed. As is often the case, the Taliban had been working in shifts, with one team responsible for digging the hole and planting the trigger, and another team detailed to bury and connect the homemade explosives. On Friday, the Marines spotted three men digging on the same road. This time there were no civilians around. A Marine attack helicopter blasted them with cannon fire. Let’s be specific. No one wants to see children die. It might have been the case that had Captain Zinni been free to call in air strikes without the approval of the JAG and staff officers, the call would have been timely enough to have been pulled off without noncombatant casualties. But what we learn in this example has little to do with the the rules of engagement or the protection of the population. This is unchanged. What we learn is that there is an every increasing degree of control over calls made in the battle space. I have a friend who has a theory, and I believe this theory to be substantially correct. The value, worth or viability of a document, call, decision or judgment is inversely proportional to the number of signatures on that document, or people agreeing to the action. We train lower ranking field grade officers to make these decisions, we give them the rules, and we send them into the battle space on our behalf. They need God at their side to help with moral decision-making. Lawyers are no replacement for God, and our officers most certainly do not need lawyers second guessing or approving their decisions. One of our favorite war correspondents, C. J. Chivers, weighs in on the performance of the ANA in Marjah. MARJA, Afghanistan — As American Marines and Afghan soldiers have fought their way into this Taliban stronghold, the performance of the Afghan troops has tested a core premise of the American military effort here: in the not-too-distant future, the security of this country can be turned over to indigenous forces created at the cost of American money and blood. Scenes from this corner of the battlefield, observed over eight days by two New York Times journalists, suggest that the day when the Afghan Army will be well led and able to perform complex operations independently, rather than merely assist American missions, remains far off. The effort to train the Afghan Army has long been troubled, with soldiers and officers repeatedly falling short. And yet after nearly a decade of American and European mentorship and many billions of dollars of American taxpayer investment, American and Afghan officials have portrayed the Afghan Army as the force out front in this important offensive against the Taliban. Statements from Kabul have said the Afghan military is planning the missions and leading both the fight and the effort to engage with Afghan civilians caught between the Taliban and the newly arrived troops. But that assertion conflicts with what is visible in the field. In every engagement between the Taliban and one front-line American Marine unit, the operation has been led in almost every significant sense by American officers and troops. They organized the forces for battle, transported them in American vehicles and helicopters from Western-run bases into Taliban-held ground, and have been the primary fighting force each day. The Afghan National Army, or A.N.A., has participated. At the squad level it has been a source of effective, if modestly skilled, manpower. Its soldiers have shown courage and a willingness to fight. Afghan soldiers have also proved, as they have for years, to be more proficient than Americans at searching Afghan homes and identifying potential Taliban members — two tasks difficult for outsiders to perform. That fact raises questions about President Obama’s declared goal of beginning to withdraw American forces in July 2011 and turning over security to the Afghan military and the even more troubled police forces. There have been ample examples in the offensive of weak Afghan leadership and poor discipline to boot. In northern Marja, a platoon of Afghan soldiers landed with a reinforced Marine rifle company, Company K, Third Battalion, Sixth Marines, which was inserted by American Army helicopters. The Marine officers and noncommissioned officers here quickly developed a mixed impression of the Afghan platoon, whose soldiers were distributed through their ranks. After several days, no Marine officer had seen an Afghan use a map or plan a complicated patrol. In another indicator of marginal military readiness, the Afghan platoon had no weapons heavier than a machine gun or a rocket-propelled grenade. Afghan officers organized no indirect fire support whatsoever in the week of fighting. 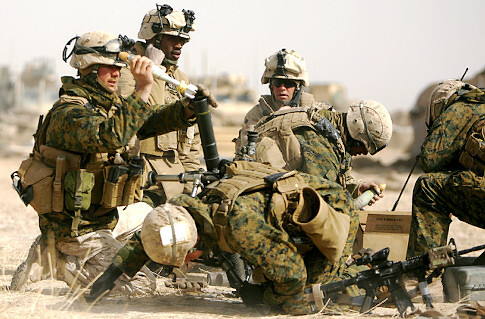 All supporting fire for Company K — airstrikes, rockets, artillery and mortars — was coordinated by Marines. The Afghans also relied entirely on the American military for battlefield resupply. Moreover, in multiple firefights in which Times journalists were present, many Afghan soldiers did not aim — they pointed their American-issued M-16 rifles in the rough direction of the incoming small-arms fire and pulled their triggers without putting rifle sights to their eyes. Their rifle muzzles were often elevated several degrees high. Shouts from the Marines were common. “What you shooting at, Hoss?” one yelled during a long battle on the second day, as an Afghan pulled the trigger repeatedly and nonchalantly at nothing that was visible to anyone else. Not all of their performance was this poor. Sgt. Joseph G. Harms, a squad leader in the company’s Third Platoon, spent a week on the western limit of the company’s area, his unit alone with what he described as a competent Afghan contingent. In the immediacy of fighting side by side with Afghans, and often tested by Taliban fighters, he found his Afghan colleagues committed and brave. Shortfalls in the Afghan junior officer corps were starkly visible at times. On the third day of fighting, when Company K was short of water and food, the company command group walked to the eastern limit of its operations area to supervise two Marine platoons as they seized a bridge, and to arrange fire support. The group was ambushed twice en route, coming under small-arms fire from Taliban fighters hiding on the far side of a canal. After the bridge was seized, Captain Biggers prepared his group for the walk back. Helicopters had dropped food and water near the bridge. He ordered his Marines and the Afghans to fill their packs with it and carry it to another platoon to the west that was nearly out of supplies. The Marines loaded up. They would walk across the danger area again, this time laden with all the water and food they could carry. Captain Biggers asked the Afghan platoon commander, Capt. Amanullah, to have his men pack their share. He refused, though his own soldiers to the west were out of food, too. Captain Biggers told the interpreter to put his position in more clear terms. “Tell him that if he doesn’t carry water and chow, he and his soldiers can’t have any of ours,” he said, his voice rising. Captain Amanullah at last directed one or two of his soldiers to carry a sleeve of bottled water or a carton of rations — a small concession. The next day, the Afghan soldiers to the west complained that they had no more food and were hungry. It was not the first time that Captain Amanullah’s sense of entitlement, and indifference toward his troops’ well-being, had manifested itself. The day before the helicopter assault, at Camp Leatherneck, the largest Marine base in Helmand Province, a Marine offered a can of Red Bull energy drink to an Afghan soldier in exchange for one of the patches on the soldier’s uniform. Captain Amanullah, reclining on his cot, saw the deal struck. After the Afghan soldier had taken possession of his Red Bull, the captain ordered him to hand him the can. The captain opened it and took a long drink, then gave what was left to his lieutenant and sergeants, who each had a sip. The last sergeant handed the empty can back to the soldier, and ordered him to throw it away. The Marines took the latitude to oust the ANP forces upon initial entry to the town of Aynak in the Helmand Province, and install a better ANP unit they had brought with them. In the case of the worthless ANA officer in Marjah, no amount of training or retraining will help. This ANA unit is completely dysfunctional from the top down, and the only solution to its problem is to sack the officer and install a new one – and to do so immediately. Until they see consequences, they won’t change. Whether they understand formations or not, if this unit is indicative of the state of the ANA we will be in Afghanistan for a very long time – decades, not years. They suffer from the same problems we have noted in Concerning the Importance of NCOs (citing From Why Arabs Lose Wars, Norvell B. De Atkine), with entitlement mentalities and very flat organizations that don’t recognize the value of NCOs. The strength of the U.S. military is, quite literally, the NCOs and enlisted men. C.J. should keep up the good reporting and watch his six. One week into the invasion of Marjah, Afghanistan Marines and NATO forces are beginning to feel the restrictions put on them by their own rules of engagement. The roughly 800 Taliban insurgents who decided to stay and fight need to be carefully distinguished from tens of thousands of innocent civilians before they can be engaged by coalition forces. The goal, says NATO’s top general in Afghanistan, is to win the hearts and minds of the population, not to decimate it. There are some exceptions to the rules. 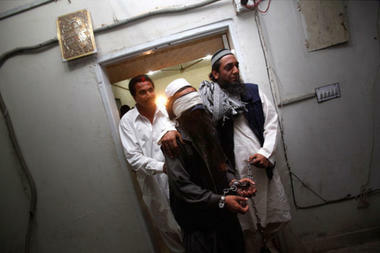 If a wanted terrorist is picked up by a U.S. Special Forces unit working under the confines of Operation Enduring Freedom, rather than NATO, that prisoner would be sent to a detention facility at Bagram Air Base, where U.S. interrogators would be free to question him within the guidelines of the Army Field Manual. Justin is behind the times (see ROE category). The Marines aren’t just now beginning to feel the restrictions of ROE. But the last paragraph is particularly troubling, because it means that  we are still pursuing the silly HVT campaign in Afghanistan with our special operations forces, and  apparently, the Marines engaged in fighting in Marjah are under the purview of the ISAF and not Operation Enduring Freedom. Thus, they are subject to the detention policy. As for the use of SOF, the Marines had them (Recon, and likely Scout Sniper) inside Marjah before the infantry moved in, directly supporting the campaign on the ground. The Army could take a page from the Marines in terms of how to use SOF. As for the ridiculous detention policy, it’s one more example of micromanaging the campaign in Afghanistan. Staff and flag officers don’t trust field grade officers and NCOs enough to give them the latitude to make extemporaneous decisions in the battle space which are conducive to the proper conduct of the campaign. It’s no different than the tactical directive on ROE issued by McChrystal, as if Lance Corporals and Sergeant Majors under fire need his counsel on who the enemy is – or how long they can detain them in the absence of a judge or a judge advocate. September 8, 2009, a deadly engagement occurred in the Kunar Province, in which three Marines and one Navy Corpsman perished in a well planned and coordinated ambush. I had predicted that the field grade officers responsible for the call to withhold artillery and air support had better be about their business finding new employment because their careers in the military were over. No AR 15-6 investigation would find fault with the tactical directive of a four star general. I was right. The absence of experienced senior leaders and inadequate action by officers in a tactical operations center, including a failure to provide effective artillery and air support, contributed to the deaths of five U.S. troops and nine Afghans in a Sept. 8 battle, an official investigation has found. The names of the colonels and the troops were redacted from the summary, which hasn’t been released publicly. The investigation found that numerous oversights contributed to the deaths of the U.S. and Afghan forces. Most involved 10th Mountain Division officers assigned to Forward Operating Base Joyce, the U.S. outpost that had tactical control of the operation. The base commander was on leave, his deputy was deployed elsewhere and the response to the ambush by the officers who manned the tactical operations center in their absence was “inadequate and ineffective, contributing directly to the loss of life,” the report said. Two majors, the senior officers there, “were not continually present” in the operations center. They left a captain who’d been on the overnight shift in charge of the center for more than four hours after the fighting began. The officers’ names were redacted from the report that McClatchy obtained. “The absence of senior leaders in the operations center with troops in contact … and their consequent lack of situational awareness and decisive action was a key failure,” it said. Another major factor, it said, was the operations center officers’ failure to provide “effective” artillery fire on the insurgents, despite repeated requests from the battlefield. Only four artillery salvoes were fired in the first hour of the operation; three were ineffective and no more salvoes were authorized from 6:39 a.m. to 4:15 p.m., the report said. The report found that the failure to provide adequate artillery support wasn’t due to a tactical directive issued by Army Gen. Stanley McChrystal that was designed to avert civilian casualties, as officers involved in the battle had believed. “A second key failure was the lack of timely air support,” the report said. An unidentified officer denied requests from the battlefield to send a helicopter gunship that was minutes away because the requests weren’t sent through his brigade headquarters and the aircraft was assigned to another operation, the report said. So that’s how it ends. During and after the battle, those under fire might claim that they said certain things over the radio, and they might claim that they heard certain responses back, but if any blame redounds to the tactical directive, we can rest assured that those under fire that day are merely confused because we know better than they do. We have read the AR 15-6 investigation, and it says that this was all just a perception on their part. On the other hand, the McClatchy reporter, Jonathan S. Landay, was there as well, and under fire. He reported that “U.S. commanders, citing new rules to avoid civilian casualties, rejected repeated calls to unleash artillery rounds at attackers dug into the slopes and tree lines — despite being told repeatedly that they weren’t near the village.” Everything else reported that day Landay, the NCOs and field grade officers present in the fire fight was correct, including no response to requests for air support due to the unavailability of assets. Artillery was available to fire white phosphorus smoke rounds to cover their retreat. But when it comes to the issue of refusal of artillery to fire anything but white phosphorus smoke rounds due to the rules of engagement, the Marines were just dead wrong that day. No one who refused to allow artillery support of the engagement did so as a result of McChrystal’s tactical directive. The 10th Mountain officers and NCOs “failed to monitor a rapidly degenerating (sic, degrading?) tactical situation,” but apparently had no problem supporting the Marines with white phosphorus smoke rounds that couldn’t possibly cause any collateral damage to noncombatants. I believe everything I read in AR 15-6 investigations. And pigs fly. Mullah Abdul Ghani Baradar’s Capture: What Does it Mean? Today, the Times is reporting that the real story behind Baradar’s capture is that Pakistan wanted to gain a place at the table in negotiations between the U.S. and Karzai and the Taliban. Specifically, Baradar, it turns out, was one of Karzai’s main contacts with the Taliban for years, and he was at the center of efforts to negotiate a peace with the Taliban. Pakistan was frustrated at being excluded from the talks, so it snatched up Baradar to gain an advantage. The Times quotes an unnamed American intelligence official: “I know that our people had been in touch with people around [Baradar] and were negotiating with him. So it doesn’t make sense why we bite the hand that is feeding us. And now the Taliban will have no reason to negotiate with us; they will not believe anything we will offer or say.” If this is true, then the capture of Baradar is not exactly what it first appeared. And if Baradar was as central to Karzai’s and America’s efforts to negotiate with the Taliban as the article suggests, then there appears to be significant costs to the capture. Perhaps it was even unhelpful to Karzai and the U.S. Does capturing Baradar really further U.S. strategy? (Perhaps the administration did not view him as a valuable contact and thought he would be more useful in custody and subject to interrogation.) Or does it actually harm U.S. strategy? Was it forced on the Obama administration by the Pakistanis? If so, does the administration’s triumphant tone reflect its true feelings about the importance of capturing Baradar, or is it a smokescreen? The fact that the New York Times, not known for its strength of objectivity in covering the Obama administration, is reporting this suggests to us that there’s a better-than-even chance that the administration is trying to turn a lemon into lemonade. So this analysis relies on the notion that this is more Pakistani duplicity. Ralph Peters, on the other hand, sees the world with much more intrigue (I must quote at length). The capture of Mullah Abdul Ghani Baradar — the Taliban’s equivalent of Gen. Stan McChrystal — by Pakistani agents and CIA operatives is a big win. Subordinate only to Mullah Omar, the Taliban’s CEO, Baradar ran the Taliban’s military operations in Afghanistan. Responsible for the upgrade in insurgent tactics — fighting smart, rather than just fighting — he also created the Taliban’s hearts-and-minds campaign. For two weeks, he’s been under interrogation by Pakistan’s Inter Services Intelligence agency. The CIA’s also involved in the questioning on some level — but the ISI always holds back some chips. The grab won’t affect the ongoing fight for Marjah in Afghanistan, but the loss of Baradar’s operational savvy could degrade future Taliban operations. And if he sings — as we’re told he’s doing — it could be the biggest anti-Taliban bonanza since 2001. * Why did the ISI and its overseers agree to bust him now? They’ve known his whereabouts for years — intermittently, if not consistently — just as they monitor the movements of most insurgent bigwigs. * Did the Pakistanis act at last because the CIA cornered them into it? Or is this a deeper tale of rivalries, betrayals and Pakistan’s long-term ambitions? Perhaps Baradar was too effective a commander for Islamabad’s plans — or too independent for the ISI. Reportedly, Baradar had been defying commands from Mullah Omar, who the ISI has backed for almost 20 years. Was this the intel equivalent of a gangland hit? And what role did the other insurgent groups play? Pledged to cooperate with the Taliban, the savage Haqqani network based in North Waziristan is protective of its turf. Was Baradar’s growing power a threat to Maulavi Jalajuddin Haqqani and his bloodthirsty son, Sirajuddin? Did they rat him out? Behind his displays of Muslim piety, Hekmatyar’s an opportunist out for Hekmatyar. He’s also the figure the ISI is most confident it can control (the Taliban’s become annoyingly independent). The Pakistanis may foresee a deal between Hekmatyar and President Hamid Karzai, which would get the Americans out — then leave the hapless Karzai dangling from a lamp post like Najibullah, Moscow’s last man in Kabul. To make that work, the Taliban would have to be under control: still a menace to Americans, but manageable for Pakistan, once our troops and NATO’s go home (the Obama administration would leap at the chance to recognize “Afghan reconciliation”). This is a crime-family power struggle — “The Godfather,” AfPak style. The ISI may have pretended to roll over for us on Baradar, when Pakistan’s generals wanted him out of the picture, anyway. If he turns stoolie (angered by his betrayal) and the ISI finally does move against the Taliban, it signals they’ve tipped decisively toward Hekmatyar. This is a lot of complex intrigue, but a cursory review of my advocacy shows that not only have I not supported “negotiations” with the Taliban, I have not supported the same with Hekmatyar. It may take a long time for the truth to be told concerning this capture and surrounding events – or, we may never know the complete truth. Either way, I still don’t buy into the notion of the high value of high value targets. I see all of this mainly as a momentarily intriguing distraction. We might get some good intelligence for a while, at least until his knowledge base becomes dated and useless. The Pakistani ISI (and some Army) is duplicitous, regardless of whether Peters’ account is correct. Hekmatyar is trouble, and negotiations with him will come to no good end. Anyone in Mullah Omar’s circle cannot be trusted, and negotiations with his shura will come to no good end. If the sum total of Baradar’s capture is to end these juvenile and ill-conceived negotiations with the Taliban and ensure that they don’t trust us, then so much the better. As I said before, I’m in the school which advocates killing the enemy in large numbers. Spc. Andrew Szala of Newport, R.I., tried to keep the injured man talking, conscious. He chatted about the plot of a season of the American comedy series, “The Office,” a send-up of white-collar life. “Michael starts his own paper company. Pam goes with him. Jim stays behind,” Szala said as the battle raged. In the new ambush, a man was firing from above a green door. Spc. Richard French of Indianapolis was in the hatch of a Stryker, an American military vehicle, that pulled up on the canal road. He saw the man and opened fire with his M4 rifle. Close to the road and relative safety, soldiers saw a man in black walking. He was unarmed. They watched him in their scopes but did not shoot. Western forces in Afghanistan are operating under rules of engagement, or ROE, that restrict them from acting against people unless they commit a hostile act or show hostile intent. American troops say the Taliban can fire on them, then set aside their weapon and walk freely out of a compound, possibly toward a weapons cache in another location. With gunfire coming from several directions all day long, troops managed to advance just 500 yards deeper as they fought off small squads of gunmen. US Lance Corporal Travis Anderson from Iowa alleged that Marjah residents are “using our rules of engagement against us,” stating that his platoon had repeatedly seen men dropping their guns into ditches before walking away to melt among civilians. I had predicted that these rules would have the opposite affect from that intended, i.e., that they would fail to prevent noncombatant deaths and might even cause more than if we were to implement a more robust set of ROE or simply leave the rules unchanged. Strategy Page sources explain a bit more about the unintended consequences of the restrictive ROE. The fighting in Marjah would be going more quickly were it not for the more strict ROE (Rules Of Engagement), intended to minimize civilian casualties. The Taliban and drug gangs have invested a lot in the local media, to make each civilian death, at the hands of foreign troops, a major story. The majority of civilian combat deaths are at the hands of the Taliban or drug gangs, and the local media plays those down (or else). It’s a sweet deal for the bad guys, and a powerful battlefield tool. The civilians appreciate the attention, but the ROE doesn’t reduce overall civilian deaths, because the longer the Taliban have control of civilians in a combat situations, the more they kill. The Taliban often use civilians as human shields, and kill those who refuse, or are suspected of disloyalty. In places like Marjah, civilians are eager to get the Taliban killed or driven away, as quickly as possible. The number of civilian deaths, at the hands of NATO/Afghan forces, in the operations around Marhah, are spectacularly low by historical standards. The troops know this, some of the civilians know this, but the media doesn’t care and the Taliban need a media win, as a way to extract something that is, otherwise, a military disaster for them. Some of this is the tendency to micromanage the campaign on the part of field grade and staff officers, an evolution that appears to have been going on for years. But despite the best of intentions, the current rules place U.S. troops in greater danger than before, removes battle space latitude and decision-making from the enlisted men, NCOs and lower ranking officers who are in the actual combat, and add absolutely nothing to the good will of the Afghans who are noncombatants because no lives are being saved as a result of the rule changes. The rules are a spectacular failure. It sounds like a government program, no? Oftentimes I disagree with Ralph Peters. I have disagreed with him vehemently on how to conduct the campaign for Afghanistan (among other things), with Peters advocating the small footprint model with SOF killing HVTs. It would have been a worse logistical nightmare than what we have now, with SOF having to be sent in later to rescue the SOF who had been relegated to large bases for force protection, unable to gain any actionable intelligence for their HVT raids because no one would cooperate with them. But occasionally Ralph gets it right. Attacking behind a vanguard of special operators and backed by an Army Stryker battalion, the 6th Marine Regiment has been conducting a textbook takeover of the Afghan city of Marjah. Meticulously planned and methodical in its execution, the operation is well on its way to fulfilling its goals of driving the Taliban out of this opium-poppy center of 80,000 souls, while minimizing casualties and destruction. In dramatic night helicopter assaults, lead Marine elements cordoned off Marjah, setting the stage for follow-on waves to maneuver into the city. That’s not as easy as it sounds: The Taliban, knowing the attack was coming, planted roadside bombs, mines and booby traps by the hundreds — forcing frequent pauses to disarm them. And broad irrigation canals (funded by US taxpayers back in the 1950s, the last time we tried to modernize Afghanistan), also impede progress, requiring the emplacement of tactical bridges. For the Marine infantryman shouldering a 100-pound ruck, there can be a lot of hurry-up-and-wait. But these obstacles were foreseen by the planning staff, and the 6th Marines’ motto is “Keep Moving.” One by one, the IEDs are dismantled as the Marines push deeper into the city. There’ve been some foiled ambushes, as well as firefights with Taliban stay-behinds. But the gunmen are no match for our Marines. This is a major operation, involving over 15,000 US, British, other NATO and Afghan troops. Marjah’s the main objective, but not the only one. The mission is to wrest a key opium-growing, income-producing region from the Taliban — and keep it. Once our fighters have done their part, though, the Afghan government has to step up. Thousands of Afghan troops are “participating,” but, thus far, the heavy lifting’s been done by the US and our NATO allies. Afghan soldiers tagged along to show the flag, learn how to operate, and help us deal with the locals. They still can’t do any of this stuff on their own. Yet ultimate success in the Marjah district depends on the Kabul government delivering meaningful aid programs at the pick-and-shovel level. Above all, it has to impose its authority with competent, reasonably honest police and Afghan National Army soldiers capable of protecting the surrounding countryside. That’s a tall order for the troubled regime of President Hamid Karzai. The Marjah operation’s a prototype — the first big test of Gen. Stan McChrystal’s refurbished approach that emphasizes cutting back combat actions focused on killing Taliban fighters in favor of securing population centers and bidding for popular support. The unanswered question is whether you can win a war of any kind without killing your enemies in large numbers. Can this population really be won over? Can the Karzai government gain and sustain the people’s loyalty? Or do the Taliban merely rally elsewhere, denying us decisive results? Stay tuned. It isn’t over yet, but when it is, it will have been a textbook takeover. I’m in the school which advocates killing the enemy in large numbers.